To commemorate the Centenary of the First World War, a series of borough-wide events will be launched by Richmond Council throughout the year to mark the anniversary. The brochure ‘Commemorating the first World War in Richmond upon Thames’ has been launched by Richmond Council to give an overview of the activities taking place between July to December 2014. It provides details of 9 exhibitions, and 42 events including commemorations, community events and learning programmes as well as key highlights for future years. 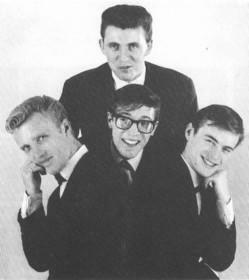 54 years ago, on 17th June 1960, the Shadows recorded “Apache”, an instrumental that introduced to the UK a new and exciting sound played on a new and stylish American guitar - the Fender Stratocaster. Like many other British musicians the Shadows were fed up with the lack of decent guitars in the UK - so they decided to import one for themselves. Whenbq. “Apache” was released in July 1960 it went straight to No. 1 and stayed there for 5 weeks. 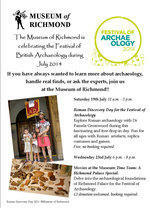 The Museum of Richmond is delighted to be taking part in the Festival of British Archaeology 2014. Co-ordinated by the Council for British Archaeology, the Festival offers over 1,000 events nationwide, organised by museums, heritage organisations, national and country parks, universities, local societies, and community archaeologists. If you have always wanted to learn more about archaeology, handle real finds, or ask the experts, just us in July at the Museum of Richmond. A public meeting has been called for Thursday, 3 July 2014 at 6.30pm in Winchester Hall, Turks Head where an action group is getting together. The proposed new river park in Richmond upon Thames could become home to the Queen’s Royal Row Barge, should planning permission be approved. 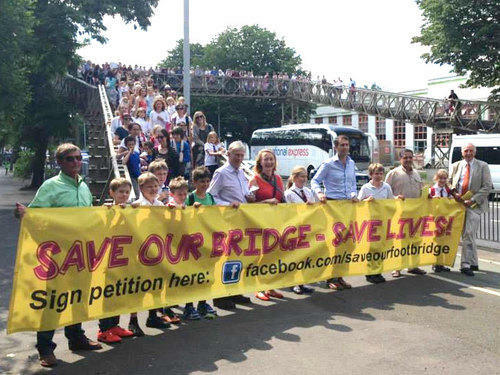 Local Liberal Democrat Councillors, Alexander Ehmann, Ben Khosa and Geoff Acton (Councillors for St Margarets and North Twickenham Ward) have put their weight behind local residents and concerned parents, who have expressed dismay over TfL’s recent proposal to dismantle the current footbridge crossing of the A316 at St Margarets roundabout and replace it with Toucan crossings. Once upon a time there was a man living in these parts called Henry Budd and he was absolutely loaded. Not only did he own the riverside estate “Twickenham Park” in what was to become St Margarets but he also had properties on Marine Drive in Brighton and Russell Square in London as well as a rather prestigious family mausoleum at St. Matthews Church in Brixton. ARThouse is Richmond’s annual Open Studios, celebrating the vast creative talent that exists within the borough of Richmond upon Thames. The David Adams Leukaemia Appeal Fund is delighted to share the news that its founder and chairman, Mandie Adams McGuire, has been honoured with an MBE in the Queens’ Birthday honours.